Our strategic vision is to gain market share using new selling and marketing techniques and embracing new technologies. We always aim to give an unsurpassed service, and constantly look to improve. Some of best Baumer Products which we proud to offer are here. 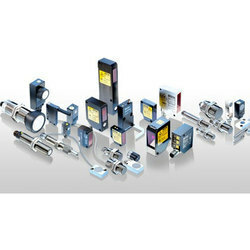 If you are seeking a Baumer Photoelectric Sensors to detect distance, presence, or absence of an object, the cost-effective variety we provide through Baumer Electric fills your need. 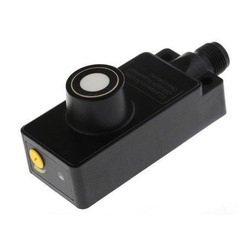 Many of these photoelectric sensors are used in industrial manufacturing applications. 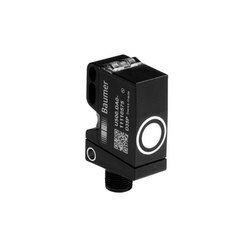 Baumer Electric’s top quality photoelectric sensors only require a power source. They independently perform amplification, output switching, modulation and demodulation. These are the newest sensors offered from Baumer, they come in two different versions the 0300 being the miniature version, and the 0500 being the larger version, but both are equals in performance. 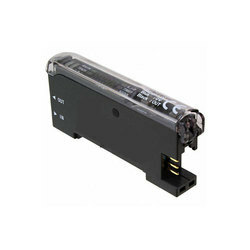 These devices utilize a system that allows for no extra receiver/reflector. This technology is called SmartReflect, and it is one of the many technologies that make Baumer sensors some of the best. 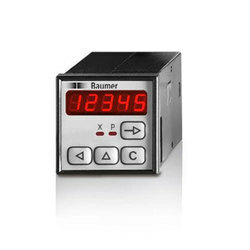 Baumer Counters, When it comes to position monitoring, movement control, speed or rotational speed monitoring, linear measurement, flow rate display, operating hour monitoring, or quantity counting – Baumer counters and electronic tachometers are just right for the job. You will always find the suitable Baumer Incremental Encoders for precise speed or position detection here: From the cost efficient standard versions to the high-resolution design with 320,000 pulses per revolution - in various designs and with robust magnetic or precise optical scanning. Optionally with HTL, TTL, or sine signals and all common mechanical interfaces. Capacitive Baumer Capacitive Sensors are seen as the true all-rounders of level measurement technology they are robust and suitable for many different uses because they can be used for detection of practically any medium. In a robust all-metal housing they are also suitable for use in aggressive media with direct contact. If the medium does not allow direct contact, they can also see through (non-conductive) container walls. They are not troubled by adhesions or dirt. 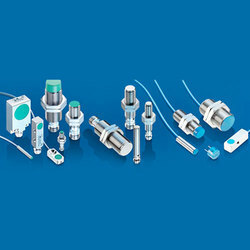 Baumer Inductive Sensors is a development pioneer and one of the leading manufacturers of inductive sensors – the heart and soul of all machines. As individual items or in large quantities - we deliver standard products in various housing sizes with different sensing distances. But always with the same high quality. Fiber optics are the ideal solution when detecting tiny objects in cramped or inaccessible places (e.g., robotics). 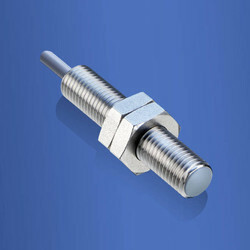 Baumer magnetic sensors have a detection speed of up to 20,000 measurements per second. Since they work on a contact less principle and do not contain any moving parts like ball bearings, for example, they are maintenance- and wear-free, easy to handle and install, and are completely unaffected by soiling. This makes them absolutely indispensable in many applications, guarantees long service times and allows them to be used reliably in rail applications or in commercial vehicles. Baumer Heavy Duty Encoders technology for extreme applications. Tough where it´s rough precise in performance. In more than 60 years of experience, Baumer has been significantly contributing towards reduced down time, increased system availability and improved product quality. This reflects in our particularly robust encoders, reliable centrifugal switches and optimally matching installation and mounting accessories. 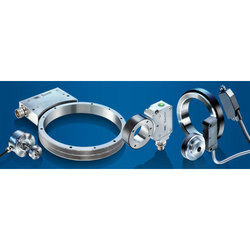 Baumer Absolute Encoders with optical and magnetic scanning. Absolutely versatile - singleturn and multiturn for reliable positioning without referencing. Optionally with magnetic or optical scanning technology, in many different designs, quick and easy to integrate. Baumer always has the right absolute encoder for you - whether traditional point-to-point or high-performance Ethernet interfaces. Baumer Bearingless Encoders Absolute and Incremental, offer non-contact operation. Most are magnetic and all of them are virtually wear-free. Their reliable function is not affected by dust, dirt or humidity. They are extremely resistant to shocks and vibrations and have a virtually unlimited service life. 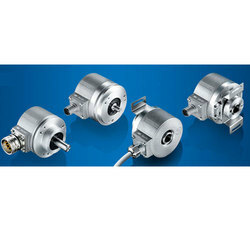 All Baumer bearingless encoders feature a very short design, so they are perfectly suited for use in cramped installation conditions and on direct drives.Compared to other measuring methods, the magnetic measuring principle tolerates a wide air gap between the sensor and material measure. 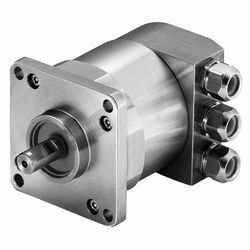 These encoders can thus operate reliably even during large shaft movements. 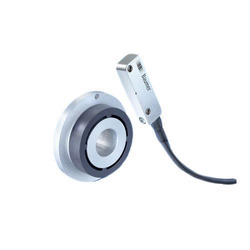 Magnetic angle Baumer Magnetic Rotary Encoders Absolute measure rotary angles up to 360° by means of an external permanent magnet and display the current position as an absolute analog signal. The sensor performs contactless and totally wear-free rotary angle measurement, which guarantees high failure safety. A high resolution up to 0.09° and a short response time of less than 3 ms allow precise control of complex operations. The magnetic angle sensors always perform measuring operations reliably in difficult conditions, under the influence of dust, fibers and moisture or in harsh industrial environments. Magnetic angle sensors are a space-saving and flexible alternative to encoders. Micrometer precision: 70 times more accurate than a hair is thick With a repeat accuracy of 1 micron, the My-Com® remains undisputedly the most accurate and most compact mechanical switch in the world. The standard My-Com® range of the most diverse mechanical and electric types largely reflects the requirements of the market. With its extremely compact design, the My-Com® can also be easily integrated in very constrained surroundings. Distance measuring Baumer Laser Distance Measuring Sensors OADM 13 – New laser sensor for particularly demanding applications.Baumer Laser Distance Measuring Sensors, The three new distance measuring laser sensors of the OADM 13 family with laser class 1 solve particularly demanding, so far unresolved tasks. At the same time, they are easy to handle. Baumer Ultrasonic Sensors through beam and retro-reflective sensors detect objects or fill levels independent of their color or transparency and are incredibly unaffected by soiling. They provide the greatest precision throughout the entire detection area. Different sonic cone profiles allow the sensor to be individually adjusted according to the object, environment and accessibility.